2015 Complete NS Bikes are here! The Clash is a true all-round fun bike. Tough and light, simple and multi-functional. This alloy hardtail will feel great to ride hard on any kind of challenging terrain. It will tackle the urban jungle, rip at the pumptrack and let you ride comfortably back home as well. A nice price and great components are the only things that clash in this bike! 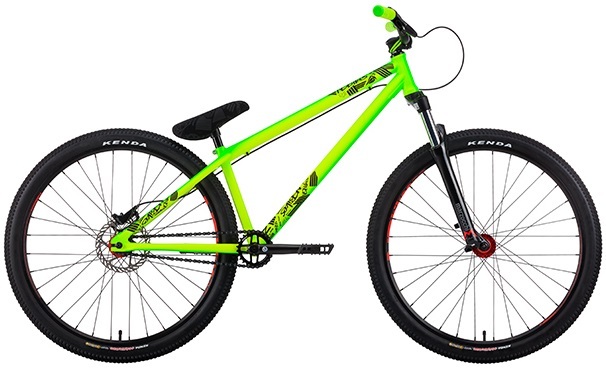 You will find the lightweight NS Quantum stem and Sam Pilgrim signature grips, NS Terra handlebar, lightweight Kenda tires and Octane One saddle on this bike. All these components are mounted on the sweet alloy frame that is built to last. The Movement is our new dedicated dirt jumping bike. With many of today’s riders preferring alloy frames over steel we decided to introduce an alternative to our popular Metropolis bikes. With the same geometry but a lighter and stiffer frame it is a great option to the Metropolis 2 for riders who do not insist on cromoly. Our new dirt bike is ready to handle anything that you throw at it. The stiff and responsive frame is a great choice for riders who spend most of their time riding (or digging) dirt. The Metropolis is a dedicated dirt jumping bike. You can take it straight out of the box and head to practice your 360 nosedives, or even go for a big backflip at a event. 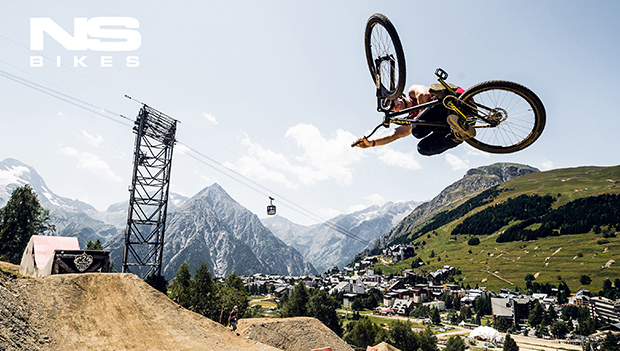 If you are not planning to go so far, hit the streets and practice some off-the-bank tailwhips. The bike is ready for this kind of stuff because it has all the features of a modern pro-level dirt bike. The geometry and parts have been chosen by our top riders, therefore the build is significantly different than what you normally find in “corporate” bikes. The Metropolis 1 features loads of great parts mounted on a multi-butted NS cromoly frame. 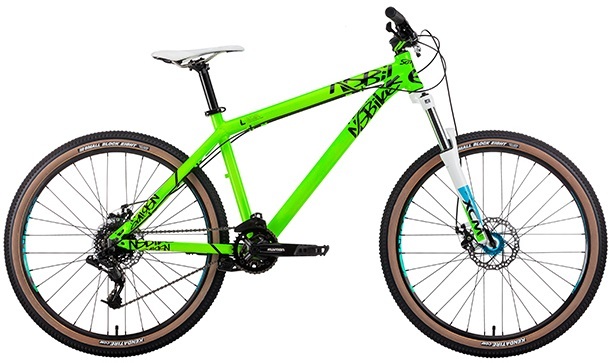 We spec’d our new Lick handlebars, Quantum stem, fast rolling Kenda Small Block 8 tires, sealed bearing hubs front and rear, a microdrive 25:11 drive-train, Sram hydraulic rear brake. The Metropolis is a dedicated dirt jumping bike. You can take it straight out of the box and head to practice your 360 nosedives, or even go for a big backflip at a event. If you are not planning to go so far, hit the streets and practice some off-the-bank tailwhips. The bike is ready for this kind of stuff because it has all the features of a modern pro-level dirt bike. The geometry and parts have been chosen by our top riders, therefore the build is significantly different than what you normally find in “corporate” bikes. The Metropolis 2 continues into 2015 as our middle-of-the-range dirt bike. Built around a full cromoly NS frame with press fit BB, fitted with NS aftermarket components, a compact drive train and hydraulic brake this classic remains hard to beat. The Metropolis is a dedicated dirt jumping bike. You can take it straight out of the box and head to practice your 360 nosedives, or even go for a big backflip at a event. If you are not planning to go so far, hit the streets and practice some off-the-bank tailwhips. The bike is ready for this kind of stuff because it has all the features of a modern pro-level dirt bike. The geometry and parts have been chosen by our top riders, therefore the build is significantly different than what you normally find in “corporate” bikes. The Metropolis 3 continues into 2015 as our entry-level dirt bike. It’s built on a solid NS frame and fitted with high end NS aftermarket parts – rare in this price category. Our aim was to make a bike accessible to everyone and offer 100% of the function that high-end bikes have, with the only compromise being slightly higher weight. There are no “do-not-jump” warning stickers on this bike! Pivot Cycles is no stranger to aluminum construction. Owner/designer Chris Cocalis is one of the most accomplished aluminum frame makers in the business. Beginning with the Mach 4, Pivot’s first five models were wrought from the stuff, and they featured a number of innovative construction techniques that set stiffness-to-weight standards which approached the best carbon frames of their day. That said, even Chris admits that carbon composites have all but eliminated the demand for metal mountain bikes, which explains why when Pivot launched its Mach 6 into the ultra-competitive all-mountain/enduro category, it was carbon fiber from head to tail. Like most bike makers, Pivot’s first carbon offerings had evolved from existing aluminum-framed models – so the Mach 6 was a bold statement: Pivot was playing the carbon game for keeps. Or so it seemed. Pivot Mach 6 Aluminum – X1 build. With sales of his carbon XC, DH and trail bikes setting new records for Pivot, why would Cocalis backtrack to make an aluminum Mach 6? The official answer is that some hydro-forming techniques have emerged that can produce variable wall thicknesses which can be prescribed at almost any location along the tube’s length. At the same time, those frame members can be profiled and tapered to add stiffness where necessary, or slimmed to reduce weight. Cocalis figured that by employing those forming techniques, Pivot could once again challenge the strength-to-weight values of elite carbon fiber frames with an aluminum chassis. Another motivating factor (no surprise here), was that an aluminum chassis could substantially undercut the sticker price of a comparably equipped Mach 6 Carbon. Finally, a large number of elite level riders have not warmed up to carbon and would prefer a metal mountain bike. Enter, the Mach 6 Aluminum. Pivot’s Mach 6 Aluminum incorporates the wider Boost fork and rear hub spacing. • Frame: variable-thickness hydro-formed aluminum tubes, dw-link suspension, ISCG05 tabs, 148 x 12mm Boost axle spacing, 92mm PressFit bottom bracket. According to Pivot’s press release, both the Mach 6 carbon and the new aluminum model have been designed to incorporate the new 148mm “Boost” rear hub spacing, which adds plenty of room for tires up to 2.4 inches wide, without lengthening the chainstays. Additional benefits of Boost are more symmetrical spoke lacing for the rear wheel and a better chain line for one-by drivetrains. Pivot states that most Shimano cranksets will operate with Boost spacing (all narrow Q-factor cranks fail the test), and some Race Face cranksets can adapt, but SRAM customers will need the extra three-millimeter-spaced Boost cranksets to get the proper chain line. In the back, Pivot says that only a Boost hub will work in order to obtain proper brake rotor and hub flange spacing. Boost forks, however, are not required. All-new linkages offer huge gains in overall stiffness – the upper linkage alone is 40-percent wider, 150-percent stiffer, and utilizes larger bearings at the frame attachment point. The new, redesigned clevis is now lighter, stronger and provides increased clamping force on the shock body. The Mach 6’s wildly shaped seat tube and swingarm mast tubes can be best appreciated when viewed from below. Pivot’s new hydro-forming and variable wall thickness technology is less apparent in the curving top and down tubes, but is definitely showcased by the lower section of the seat tube, where it bulges to reinforce the dw-link rocker pivots – and by the swingarm, which uses a wildly formed central strut that widens to pick up the asymmetrical chainstays and then tapers to brace the seatstay assembly from the left side of the junction. All of the cable housing runs are full-length and external, with the exception of the internally routed right chain stay and a seat-tube port for a Stealth-style dropper post. The Mach 6 Aluminum is spec’d with the 2016 Fox Factory Kashima with the new EVOL air sleeve, custom tuned specifically for enduro and trail riding. DPS stands for Dual Piston System – the shock features two separate sets of valving, similar to what you would find in Fox’s external reservoir Float X design, while the EVOL sleeve significantly reduces the force required to initiate travel, for the ultimate in small bump compliance and better bottom-out resistance. Pivot also warns that the Mach 6 Aluminum (and the 2016 carbon Mach 6) was designed to work with the progressiveness of an air spring. and that coil shocks cannot provide the necessary spring curve, and will result in excessive bottoming. That should not be a huge issue, as the performance of air-sprung shocks has been elevated to near-perfection by pro-level enduro competition. Another possible concern is the yoke type rear shock attachment, which Pivot has designed to work with conventional shock eyes. The good news is that Pivot’s yoke is compatible with most popular shocks, including the Cane Creek DB InLine. New forged-aluminum shock extension and stiffer dw-link rockers. Direct-mount 160mm brake caliper and Boost rear spacing. Clearance for 2.4-inch tires and Enduromax bearings throughout. The new Mach 6 Aluminum is available in five sizes, from X-small through X-large, to fit riders from 4-foot, eleven inches (150cm ) to well over six feet tall (+190cm ). Beyond the switch to Boost hub spacing, the Mach 6’s geometry is the same as the 2015 carbon version, which is a good thing. Pivot will offer a wide range of builds, from pro-level Shimano XTR and SRAM XX1, to more attainable Shimano SLX and SRAM X1-based ensembles. Pricing and weights of all build options have not been released, but complete builds will start at $3499 and Mach 6 Aluminum frames with the Fox Kashima Float Evol shock wil retail for $1999 USD. Mach 6 Carbon XTR: The molds have been re-cut to add Shimano Di2 compatibility and to adapt to the new dw-link rockers, The new swing arm is designed around the wider Boost hub standard, with more tire clearance and additional stiffness. Many minor changes have been implemented to the 2016 Carbon Mach 6, but its appearance is virtually the same as the 2015 model, The new Boost-width swingarm ensures that there will be plenty of clearance for tires up to 2.4 inches.